Venus is similar to the Earth in size (6051 km radius compared to 6378 km for the Earth) and in density (5.25 compared to 5.52). 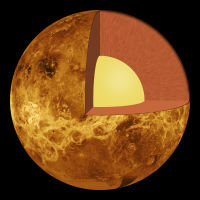 Venus has a similar internal structure to the Earth: crust, mantle and core. This is how we deduce that the two planets have a similar internal structure, but this is not certain. Its average density (5.25g/cm3) indicates that Venus, like the Earth, must be made up of silicate rocks, and be a differentiated planet. Despite the lack of seismological data, a model of the internal structure based on gravimetric data has been proposed. This suggests that Venus has a core of 2900km radius that has two parts: an external core made of liquid iron and nickel and an internal core made of solid iron and nickel. 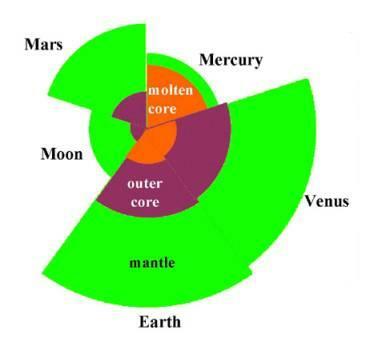 A comparison of the different cores of the telluric planets and the Moon (© GH Rieke University of Arizona ). Up to now we have not measured a magnetic dipole field on Venus. This could be due to its slow rotation or major changes in its past, but it may tell us things about its internal structure: Perhaps Venus does not have a liquid core. question on whether the core is liquid or solid remains open; calculations of the inertial moments of Venus are impossible because it rotates too slowly. The temperature of the core is also unknown because, like all large bodies, the decay of radioactive elements in the core should release enough heat that must be transported away from the core by convection. Previous missions, however, have never seen any sign of tectonics, so the heat transport method on Venus is perhaps very different to Earth. What we can say at least is that the internal structure is limited. The core is probably surrounded by a silicate mantle of about 3000km thick; with hot enough external layers to provoke a partial state of fusion between the materials, down to fairly deep levels. The thickness of the crust, as determined by tectonic deformation and viscous relaxation models, is estimated to be between 10 and 30 kilometers. Analyses by different Venera probes proved that the external material of Venus is similar to Earth granite and basalt (silicate rocks with metals). The system of continental plates is less complex than on Earth, the more plastic rocks absorb most of the effects of continental drift.